Get an extra 50% off all sale styles. Plus, Tillys Moola: for every $50 you spend, earn $10 off a purchase of $30 or more, in-store or online 09/06/2016 thru 09/25/16. 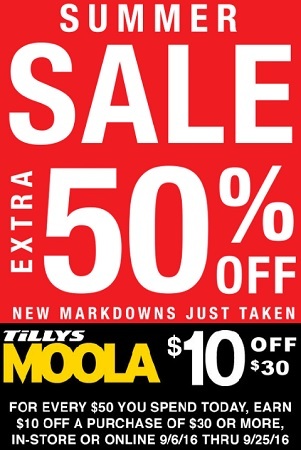 Offer is valid at U.S. Tillys stores and Tillys online. Source of the information is Tillys. Offer is time limited. For more details see any Tillys store or Tillys online.